This magic bus ride has landed in some very strange territory. In fact, the passengers of Shuttle 34 have entered the land of Lilliputians where they are the Lilliputians. It's not all bad but it is increasingly dangerous and the time to move is now. 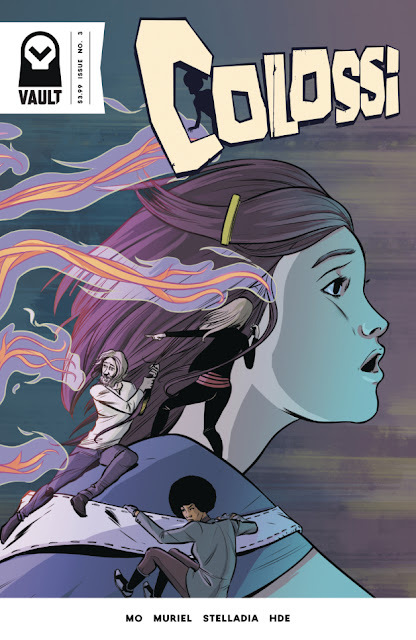 'Colossi' from Ricardo Mo, Alberto Muriel, and Stelladia is where 'Lost' and 'The Twilight Zone' meet. In a future world, the driver and passengers of commuter Shuttle 34 take an abrupt detour through a wormhole arriving in another dimension where they are the size of action figures on a planet much like earth. If you've seen 'Honey, I Shrunk the Kids,' then you'll get the gist with similar stakes except for some other-worldly pursuers. Mo creates a varied group of characters and Carmen the driver leads them as best she can when others try to do their own things. There's an interesting dynamic between them and a young girl from this dimension that has shared her dollhouse and toys. They look normal size to this band of travelers from a toy car to a toy bathtub. They make do but they're in danger and have to make a break for it. Muriel does a wonderful job of providing the perspective of these tiny passengers. The blades of grass, the trash can, the chicken drumstick, all take monumental proportions in their eyes. The layouts, as the action picks up, are smooth and energetic. Muriel delivers an effective and chilling expulsion of a spirit from a body. Stelladia colors it all with subdued but rich hues. 'Colossi' doesn't offer a lot of answers or explanations and doesn't have to. This spunky group of travelers are on one hell of an adventure. Mo mixes sci-fi, suspense, and mystery with expressive artwork from Muriel and Stelladia. With one more issue left in this bizarre little miniseries, it's vital that you catch up now because the conclusion should be a doozy.